Is the presidency a luxury - and an expense - the State can really afford? Uachtarán na hÉireann Michael D Higgins and the British queen, Elizabeth II. On August 28, the St Vincent de Paul reported a 20 per cent increase in calls for “back to school help”. The same day, the man presiding over the housing crisis, Minister Eoghan Murphy, announced the election date for the most lucrative Irish political post - the presidency - with a salary of €325,507 plus untold expenses. These two announcements side-by-side expose crass divisions in our society. Many families cannot afford to send their children to school without charity. Not only is there mass poverty but also our education system is not “free”. In a civilised society schoolbooks and accessories would be free and there would be no “voluntary” contributions expected from parents for the school’s upkeep. However, we live in a banana republic and the person, who will supposedly be our representative, will live like a king or queen. “Scrap the presidency” was Insider’s immediate reaction to these two news items. The luxuries we bestow on the ceremonial President is something we neither need nor can afford. Yet, on reflection, maybe it makes more sense to embrace the EU and Irish State’s fervour for privatisation and sell off the Irish presidency franchise to the National Lottery, now a private entity, or Paddy Power. The presidency could be repackaged as the “Who wants to be a Millionaire” lottery draw, which could be held every Christmas. This would conform to the political establishment’s neoliberalism and win over the Irish Left by arguing it would make the presidency much less exclusive if every punter could buy a ticket and end up being waited on hand and foot in Áras an Uachtaráin. With a weyr of “Dragons” joining the presidential race, maybe Channel 4 would enter the bidding seeing the potential of turning the presidential election into a reality show - contenders battling it out in the Áras where we can watch them interact with one another and more importantly see how they treat the unfortunate staff. We have privatised more important institutions - not least Eircom. The corporate buyers made mega profits. Rural Ireland was abandoned. Broadband in the countryside was not profitable. In contrast, privatising the presidency will not hurt the Irish people. With competing bidders we could make and save a fortune. Not only dispense with the huge day-to-day expenses of the presidency, but also offload the huge annual pensions paid to former presidents. Mary McAleese gets €141,000 and Mary Robinson €134,883. Imagine getting that annual windfall for the last 21 years like Mrs Robinson! Having flogged the Irish presidency to a gambling or media group we can use Article 14 of Bunreacht na hÉireann for a cheaper replacement. It states, in the permanent absence of the president, a commission consisting of the Chief Justice, the Ceann Comhairle, and the Seanad’s Cathaoirleach, would carry out the relevant functions. Problem solved! Some may argue that the presidency is important because certain presidents – Mary Robinson in particular - made a significant contribution to Irish life. She was the first female President of Ireland and some see it as a symbolic first step on the road to female emancipation. Undoubtedly it empowered some women, especially after the dark 1980s, which saw the insertion of the medieval Eighth Amendment into the Constitution and the defeat of a divorce referendum. A symbol she may have been, but the work of UTV journalist Chris Moore played a bigger role than anyone in freeing the Irish people from the clutches of the Catholic clergy by bringing to light the criminal activities of Father Brendan Smyth. Once that vile can of worms was opened there was no going back. It is interesting, however, it took a journalist from outside the southern State to break this story of clerical child abuse. The horrendous death of Savita Halappanavar was also crucial in people jettisoning the remaining chains of the Church. Robinson’s reign spanned the crucial period of the peace process in the Six Counties. Her record was anything but exemplary. Her deeply pro-Unionist views were reflected in her lack of empathy for the suffering of the Catholic community. On a visit to Enniskillen she quite rightly laid a wreath as a mark of respect to the 12 people murdered in an IRA bombing atrocity. However, she then went to Derry and refused to lay a wreath at the monument to the 14 innocent civil rights marchers murdered by British paratroopers on Bloody Sunday – a pivotal event in the history of the “Troubles”. Hypocritically, she justified this on the basis that to lay a wreath would have been a “political” act. Ironically her next post was as UN High Commissioner for Human Rights. Fortunately, it was Taoiseach Albert Reynolds, and not Robinson, who navigated the peace process in its crucial first couple of years. It is not titular heads we need, but politicians who seek to truly represent the people’s interests. Arm yourself with a dictionary, and forensically examine the grandiose speeches of President Higgins and you will find, buried among the big words, some snippets about social justice. If President Higgins genuinely wanted to reach out to the victims of such injustice, he would need to speak in their language. If President Higgins had spoken like that he would not be getting the support of FG, FF, Labour, or the Social Democrats. Their support shows he is a “safe pair of hands”, part of the establishment. He will not rock the boat. 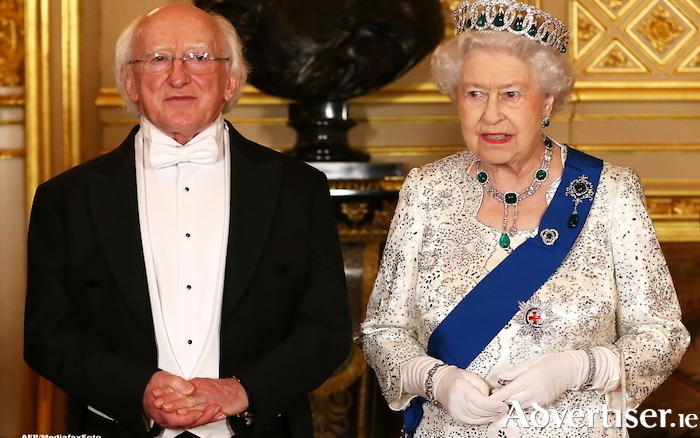 President Higgins is enamoured with the royal trappings of the presidency. He has even adopted and adapted some of the symbols of the English royals. The English queen has her corgis, “our” president has his Burmese mountain dog. Insider thinks the presidency is completely detached from the ordinary people. It has a status where the Irish President is not our representative, but we are his or her subjects. The extravagant salary and add-ons are partly responsible. Hence, President Higgins saw no problem last February using the government jet for an overnight in Kerry to carry-out two mundane engagements, which cost you and me €11,430. A friend of Insider's, a HSE official, asked rhetorically: “How many home help hours would that pay for?” Insider did the maths: at least 1,040 hours. Such facts put the grand speeches in context. What attracts the “Dragons” is less the dosh than the status it would bestow on them both at home and abroad. In royal fashion the “first lady” would don the regal purple - a colour to which Mary I and Mary II were also partial. In Revolutionary France it would have been off with their heads. Here in the banana republic the only thing we should cut is our losses and flog this worthless presidency to the highest bidder.